Smart Football: Run & Shoot Series Part 4 - The "Streak"
Run & Shoot Series Part 4 - The "Streak"
It's been a bit since my last installment, but I'm not quite done, as there are two concepts left in the fearsome foursome of the 'shoot. This foursome includes: go, choice, and now streak and switch. These two plays really do not involve any new learning, and although considered separate plays, they really are two sides of the same coin: four verticals, which I analyzed recently with Dan Gonzalez. I begin with "streak." The switch will come in the next installment. At core, streak is just what the run and shoot guys call "four verticals." And four-verticals is a very simple concept that is so powerful because well designed pass plays boil down to elementary math: geometry and arithmetic. Four receivers bolt down the field, and if they keep the proper spacing between them -- by staying on their "landmarks" -- the defense will be outnumbered and can't properly defend the play. Against Cover Two, well, the defense only has two deep (hence the name) while the offense has four receivers deep. With cover three, well the offense still has a man advantage. And, again, if the spacing is correct, the offense can even whittle it down so that they know who they are operating against, namely, the deep free safety. But this doesn't mean that the defense is without options. They can disguise coverage, play different techniques, or quite simple play four deep -- four on four gives the advantage to the defense. (Contra Ron Jaworski, creating favorably one-on-one matchups lags far behind creating favorable numbers advantages, i.e. two on one defend.) In response, the run and shoot, as usual, gives them freedom. Hence, the "seam read" all over again. The outside receivers will release on go routes. The "frontside" one (in the diagram, the one on the offense's right) has a mandatory outside release: he will keep pushing to the defender's outside hip. That said, he still wants to keep five yards between him and the sideline, to give the quarterback a place to drop the ball into. The slot receivers release up the seams. But they must be more precise than that: in college, they must be two yards outside the hashes; in highschool (where the hashmarks are wider), they must be on them. This spacing is the most critical element of the entire play: it is what makes it geometrically difficult for the deep secondary to cover. The runningback might be in the protection, but if he releases he will run either a drag across the field or a little option route underneath. He looks for an open spot in the zones as an outlet if the undercoverage releases for all the receivers, and against man he will cut in or out. He should be working against a linebacker and can't let that guy cover him. The outside receivers, if they can't get deep, will break the route down and "come down the stem" -- retrace their steps -- to get open later. The QB, if the initial reads are not there, will hitch up and throw them the ball on the outside. But the key to this play, as it has been for all four of these "core" run and shoot plays, is the seam read. I previously described this route in detail, but in sum: against a defense with the deep middle of the field "open" (cover two), the receiver will split the two safeties on a post route; against middle of the field closed (cover 3, cover 1), with a single deep middle safety, the receiver will stay away from him and continue up the seam. In that sense the route is a lot like the divide route I've discussed before. But the route is more dynamic: if the safeties stay very deep, or any defender crosses the receiver's face, he will cut inside or underneath those defenders to get open. Below are a few clips courtesy of Michael Drake again. In this first video the quarterback, though a bit slow, hits the seam read. On this second video, the defense is in a blitz look. (Sort of Cover 1 with a "rat" or floater, though no deep safety.) The receiver probably should have crossed the defender's face, but they are able to complete it. And below is a clip of four-verticals where it gets dumped off to the runningback. 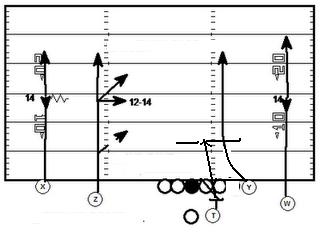 Finally, below is video of Texas Tech running the play (courtesy of Trojan Football Analysis). I end with this both because Tech of course is not exactly a run & shoot team, but also because some of the variants shown on the video -- particularly the shallow cross -- are things a lot of R&S coaches have gone to, including June Jones. Seriously though, great job with the articles and the other links- I've been enjoying them! 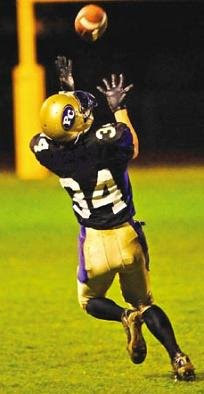 The tag you put on the far wideout to run a deep in is standard on my four verts. That way if they roll into four deep the outside routes push that way and leverage to deep ins along the hashmarks. The crease read can still run an in as well. It gives me a levels concept(deep horizontal) at the top of it vs. the coverage best able to stop four verts(streaks in my route combo term). I still get a crease/mofo read and still have one of the two slots push the seam all the way. Are tight-ends an endangered species? Past is prologue: Alabama running the flexbone?